Price £49,000.00 VAT £9,800.00 Total Ex Works £58,800.00 Total on the road price £60,200. Auto-Sleeper Broadway EK TB LP with premium and winter pack £62,995. 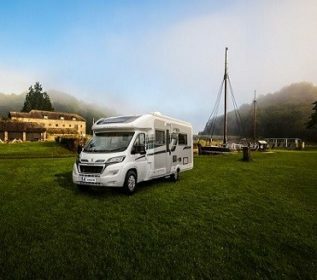 New for 2019 on the Auto-Sleeper Broadway EB 2019 is an in-dash satellite navigation system, new habitation door and fly screen and Sargent’s new control panel and Tracker system. Last season’s improvements to the rear GRP panel, new GRP inner walls and roof lining continue. Fabrics also remain unchanged, Auto-Sleeper’s Casa Mila trims proving a huge hit with owners. Again, we have the Trauma-iNet control and connectivity via Truma’s App. Finally, external colours and graphics are unchanged. 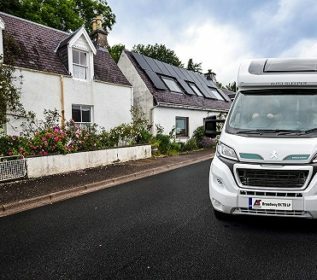 New for 2019 on the Auto-Sleeper Broadway EK, TB, LP 2019 is an in-dash satellite navigation system, new habitation door and fly screen and Sargent’s new control panel and Tracker system. Last season’s improvements to the rear GRP panel, new GRP inner walls and roof lining continue. Fabrics also remain unchanged, Auto-Sleeper’s Casa Mila trims proving a huge hit with owners. Again, we have the Trauma-iNet control and connectivity via Truma’s App. Finally, external colours and graphics are unchanged. Price £45,583.33 VAT £9,116.67 Total Ex Works £54,700 Total on the road price £56,100. Auto-Sleeper Nuevo ES with Premium and winter pack £58,895. New for 2019 on the Auto-Sleeper Nuevo ES 2019 is an in-dash satellite navigation system, new habitation door and fly screen and Sargent’s new control panel and Tracker system. Last season’s improvements to the rear GRP panel, new GRP inner walls and roof lining continue. Fabrics also remain unchanged, Auto-Sleeper’s Casa Mila trims proving a huge hit with owners. Again, we have the Trauma-iNet control and connectivity via Truma’s App. Finally, external colours and graphics are unchanged. Price £45,250 VAT £9,050 Total Ex Works £54,300 Total on the road price £55,700. 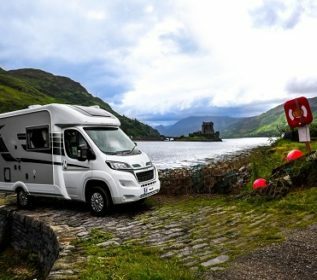 Auto-Sleeper Nuevo EK with Premium and winter pack £58,495. 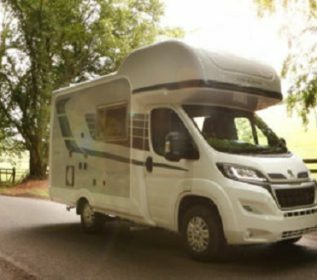 New for 2019 on the Auto-Sleeper Nuevo EK 2019 is an in-dash satellite navigation system, new habitation door and fly screen and Sargent’s new control panel and Tracker system. Last season’s improvements to the rear GRP panel, new GRP inner walls and roof lining continue. Fabrics also remain unchanged, Auto-Sleeper’s Casa Mila trims proving a huge hit with owners. Again, we have the Trauma-iNet control and connectivity via Truma’s App. Finally, external colours and graphics are unchanged.